Bosch India launched its locally developed air quality monitoring system in New Delhi at its flagship event, Future Connected: Bosch for a Smarter India. This is the first system in the market which is fraction of the size compared to other locally available products. “Bosch provides a smart air monitoring solution for the 21st century,” commented Mr. Shennoy RK, Senior Vice President, Bosch India. Bosch air quality monitoring system shares real-time reports of given regions for specific time periods. Commenting further, Mr. Shennoy, mentioned: “Some of the world’s major metropolitan cities have been grappling with health concerns, especially from those relating to air quality. Bosch India’s air quality monitoring system data key air pollutants like PM, CO, NO, NO2, SO2 and O3 and environmental parameters such as temperature, relative humidity (RH), light, sound and pressure.” Viewed as a game changer, the system can be installed by property developers, industries and policymakers. Usage can also extend to factories of the future to boost efficiency and productivity, apart from being used in smart city grids or campuses. In the age of IoT when all devices are interconnected and can speak with each other, air quality monitoring is just one of many technologies that enable this connectivity and better decision making. Its applications can boost productivity in industrial scenarios by relaying critical information, and it can also enhance the quality of life for citizens. When all other aspects of daily life are connected and compatible, it only makes sense to have an accurate indicator of environmental quality levels to devise the best living and working conditions as well. 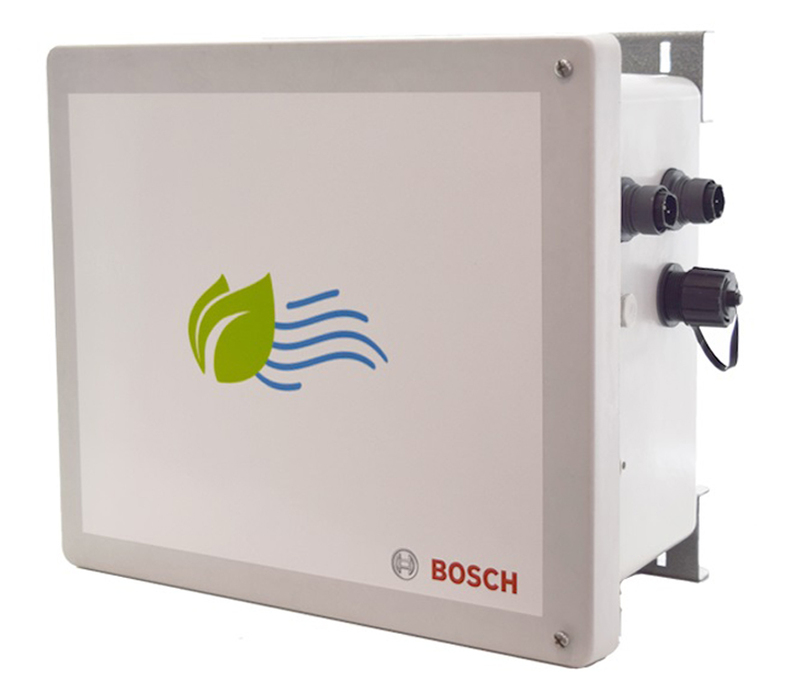 The system from Bosch goes beyond just tracking of ambient air quality and the composition of pollutants in real-time. Bosch’s Air Quality Monitoring System also effectively visualizes, analyzes and acts on environmental air quality information. Information gathered by the system is relayed wirelessly over Wi-Fi or global system for mobile (GSM) networks, and this enables flawless deployment and data collection. Built to power air quality monitoring in the IoT age, the solution uses cloud analytics, data management and visualization software that makes it a cutting edge connected device. What this translates to is energy efficiency, scalability and sustainability for real-world applications. Bosch MCMS platform has been built using Intel’s IoT technology which includes an Intel Processor, Wind River Helix Device Cloud (HDC) device management capability, and platform hardened security through McAfee. This enables end-to-end integration that allows remote devices to collect, compute and communicate data from sensors to network to cloud in a secure way.